I don't think I've slept through the night once this week. And it doesn't seem like there is any obvious thing weighing on my mind, nothing in particular that should cause me to wake up and toss and turn in the early morning hours. So true. I came across this thought-provoking quote within the album cover of a Keith Urban CD several years ago. Some attribute it to Rumi. 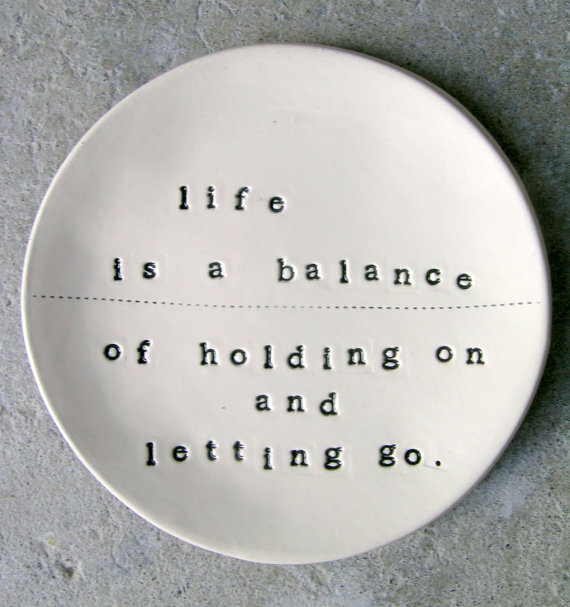 Regardless of the origin, it makes me consider my life, my balance, the holding on and letting go. Throughout life, we hold on and let go of many things—people, places, emotions, memories, dreams. But in order to know whether we should hold on or let go, we have to understand the significance, the importance, the reason why we should keep something or someone close or choose to let go. To strike the right balance in life, we have to know what's right for us, what we need and want. Everything else can afford to be let go—negative thoughts, people who bring us down, fears and failures. Holding tight to the people who love and support us, faith and hope, places that feel like home—those are the important things. Today, I'm keeping this quote in mind. Perhaps it will bring a kind of peace, guiding me to that elusive balance, helping me to see what's worth holding onto and what I simply need to let go. What should you hold onto? What should you let go?